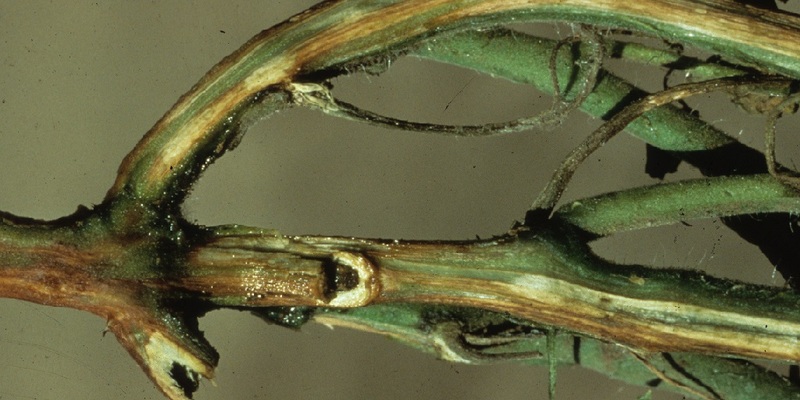 Fusarium wilt threatens tomato crops across all growing regions. Infected transplants or soil can contaminate crops, and the pathogen can live in the soil for years even without the presence of host plants. Although there is no cure for infected plants, University of Maryland Extension advises that the best defense is to grow varieties that have been bred to resist the soil-borne disease. At first look, Fusarium wilt can be mistaken for the result of poor irrigation due to the sagging appearance of the plant. However, there are several key identifiers. Since Fusarium wilt enters the plant through the roots, all symptoms begin at the bottom of the tomato plant and work their way up. Classic characteristics include yellowing and browning of foliage followed by wilting leaves and stems. Cutting into affected stems near the base of the plant will reveal brown vascular discoloration, whereas the pith remains healthy. The clogged vascular tubes prevent the transport of food and water throughout the plant which causes the wilted appearance of the plant. Infected plants cannot be cured, and they should be removed and destroyed as soon as possible to prevent further spread of the pathogen. While there are fungicides available to help battle Fusarium wilt, growing resistant cultivars is the key to managing the disease. According to Clemson Cooperative Extension, growers should select varieties that are at least resistant to races 1 and 2 of Fusarium, although some newer cultivars are resistant to all 3 races. Under severe disease pressure, growers should rotate out tomato crops every few year, fumigate the soil and practice careful hygiene in addition to growing resistant cultivars. Maintaining soil pH above 6.0, fertilizing with nitrate nitrogen and sanitizing any stakes, tools, plastic or Styrofoam that come in contact with crops with a 10% chlorine bleach solution can help limit the disease. Syngenta addresses the common threat of Fusarium wilt with a dedicated tomato breeding program that develops the best traits and resistances. Several Syngenta tomato varieties, such as Sebring, SummerPick, Pink-a-licious and Brickyard, feature resistance to Fusarium wilt and other key tomato diseases. Learn more about Syngenta’s tomato variety offerings.